This is a lovely, summery pasta dish that makes use of the two foods we’re harvesting from the allotment right now: broad beans and garlic scapes. Our garlic bulbs won’t be ready to eat for another month, but you can cook and eat the scapes; the long, curly stalks that rise out of the plant. These are actually the flower-heads which need to be snipped off anyway to divert the plant’s energy back towards the bulb, but don’t throw them on the compost heap! There’s oodles you can do with these tender, green stalks in the kitchen. You can use them as you would garlic cloves, chopping them and frying them with onions at the start of a dish, but they’re also mild enough to eat raw in salads, like spring onions, or sprinkled like chives as a garnish, and they’re excellent as a pesto. When Ade came home from the allotment with a bag of delicious broad beans and a handful of garlic scapes, I combined the two with creamy ricotta for a simple one-pot supper that can be on the table in ten minutes. If you can’t get hold of garlic scapes, a garlic clove or two should do the trick (you’re adding it raw at the end, so I wouldn’t advise any more than this), but do keep an eye out for scapes if you can as they really are delicious. Farmers markets sell them if you’re not growing your own, and they only have a short season so seize them while they’re plentiful! Put a pan of salted water on to boil. While that’s heating up, pod your broad beans and finely chop your garlic scapes. Cook the spaghetti according to the packet instructions, adding the broad beans to the pan for the last 3 mins of cooking. Turn off the heat and drain the pasta and beans, reserving a couple of tbsps of cooking water. Return the pasta and beans to the pan with 1 tbsp oil. Add the garlic scapes, the zest and juice of the lemon, the cooking water and mix well. Finally, crumble in the ricotta, the remaining oil, salt and plenty of black pepper. Mix well. 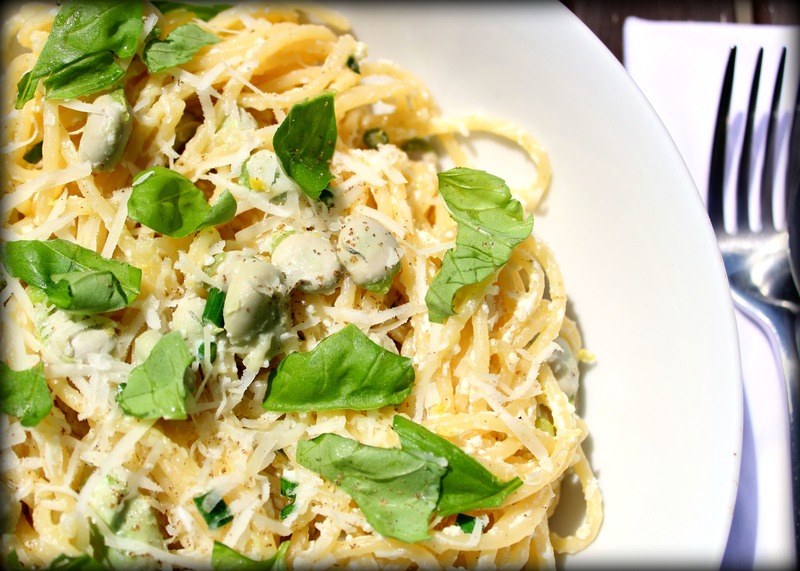 Serve with the grated parmesan and torn basil leaves. Great tip since off to the allotment tomorrow for broadbeans and noticed those green wands on the garlic. Waste not want not is my allotment motto. Looks delicious! I am thinking of putting this on our menu sometime soon. Thinking of switching the broad beans for Sugar Snap peas and the garlic whatsits for Chives / Spring Onion… madness or do you think it’ll work? ?